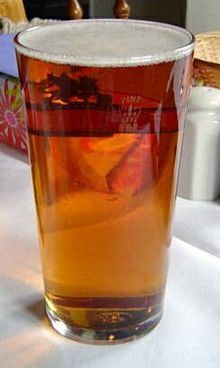 From Middle English, from Old English ealu, ealo, from Proto-Germanic *alu (compare Dutch aal, Swedish öl), from Proto-Indo-European *h₂elut- (“beer”), or *h₂elu- (“bitter”). Compare Russian ол (ol), Lithuanian alùs, Armenian օղի (ōłi); compare also Latin alum (“comfrey”), alūta (“tawed leather”), Ancient Greek ἀλύδοιμος (alúdoimos, “bitter”). Cognate to Finnish halme and Livvi halmeh. From either Proto-Germanic *halmaz or a Baltic language, compare Lithuanian salms and Latvian želmuo. In speech, type 5 (risti) is normally used, giving for instance nominative singular eil, genitive eilin, partitive eiliä, nominative plural eilit and genitive plural eilien. He ate roast beef with apples and put away two pints of ale, excited by the little taste of musky trickery given off by this fine, pale beer. “ale” in le Trésor de la langue française informatisé (The Digitized Treasury of the French Language). (poetic) plural of ala; wings. from Old Dutch *alo, from Proto-Germanic *alu, from Proto-Indo-European *h₂elut-. From Old English ealu, from Proto-Germanic *alu, from Proto-Indo-European *h₂elut-. From Proto-Slavic *alje, from Proto-Indo-European *ályos. I played well, but I lost. You have such a beautiful dress! Ale ta zupa jest dobra! Ale, ale! Jeszcze z tobą nie skończyłem! Hey, not so fast! I'm not quite done with you yet! sunt ale mele aici? ― are mine here?